Or, you know, almost nothing like that. How else would you describe someone leaking information about intelligence sources in the ME to the public, out of a belief that it was some kind of horrible violation of national security for the president to pass that same information on to a foreign counterpart in a private (supposedly) secure conversation about that intelligence and how to act on it? The mental process one has to go through to do that is pretty amazing. It's on the same level as someone believing that a given brand of food product is not healthy, so they put poison in the food on the supermarket shelves to "raise awareness" of the problem. That's normally considered pretty freaking insane, right? That's the mindset that's at work here. You sound like you are describing the republicans when Obama was president, though. I'm sorry. Could you point out where conservatives leaked classified information in some kind of attempt to paint Obama in a negative light? And where the media, instead of condemning such a thing, joined in the bashing of Obama based on it? Great. So you can tell us all what facts support the notion that the Trump administration was in collusion with the Russians? Funny that no one seems to have anything solid to support any of this. It's all innuendo, suspicion, allegation, and rumor. Someone claiming something doesn't make it true. Increasing the number of people repeating something also doesn't make it true. It just makes it a well repeated lie. you realize that leak came from the whitehouse, from people that are pretty much by definition Republicans right? People appointed and approved by trump are horrified at his behavior. You're talking about this as if the democrats are somehow leaking this information to damage Trump. I am not interested in debating you, since neither of us will convince the other that we are right. I merely do some drive by commenting. you realize that leak came from the whitehouse, from people that are pretty much by definition Republicans right? If Erik Erikson is to be believed, at least one is a conservative who is so dismayed at Trump's behavior that he felt having the media report on it was the only way to try and shock the White House into changing direction. At any rate, we are literally into "Sure I sinned but it's actually your fault for noticing/reporting on my sins" territory now. Which is a pathetic argument that doesn't even deserve a response. I don't wanna be that guy, but wasn't there a whole faction in our government that cared nothing more than tearing O and then H down? It is almost as if the last 8 years completely evaporated. Surely, your memories are not that short? Not that you are wrong, but you are not saying anything new, or even vaguely insightful. Entire US political landscape is a feud between various factions. It is that kind of tribalism that will likely end this country, but hopefully not within my lifetime. I don't wanna be that guy, but wasn't there a whole faction in our government that cared nothing more than tearing O and then H down? Yeah, it was called Republicans. The first time I heard someone say that word I thought they were saying "Pity me". "He's the pity me of a politician!" or whatever. "It's okay when (the group I support) does it." Trump was kind enough to confirm that the intelligence came from Israel by saying at an open press event before meeting with Netanyahu that it's not his fault because he never said "Israel" to the Russians. he felt having the media report on it was the only way to try and shock the White House into changing direction. He must know something the rest of us don't, because that's been less than effective thus far. From the description, it mainly sounded like desperation. I take no credit for the image, it was scavenged from the inter webs! Double posts are the new rate me down. Heh, the "desu" filter still works. EDIT: I was going to comment that I haven't been hit with the double-post issue and chalked it up to "maybe because I'm premium". FAKE ASSUMPTION. SAD! I wish I would start getting hit with some double posts, never gonna make it to 10K. At the rate I post, I can use all the help I can get! That's what you get for getting too comfortable. The US is working to reassure allies that the Trump administration can be trusted with sensitive information in the wake of President Donald Trump's reported disclosure of highly classified material, US ambassador to the United Nations Nikki Haley said Monday. "I've talked with (CIA) Director (Mike) Pompeo on this as well because so much of what I do at the United Nations is based on sensitive information. So much of what a lot of the Cabinet members, what they do, is based on sensitive information," Haley said. "We're trying to reassure all of our counterparts what they tell us is kept, trust, and valued, and we will return the favor," she added. You can tell how normal all this intelligence sharing with Russia by Trump is by how our UN ambassador is trying to do damage control with out allies. Don't they know that this is all totally normal? "I can't believe ___ told ___ the big secret!" "I hope ___ doesn't tell the secret I shared with them now!" "Did you hear ___ asked ___ and ___ to lie to ___ about that so they wouldn't get in trouble?" Depending on how you fill in the blanks we can we in the elementary school playground or the White House. "HOW COME YOU'RE MAD AT ME FOR TELLING YOUR SWORN ENEMY THE SECRET YOU TOLD ME? I NEVER MENTIONED YOUR NAME!" 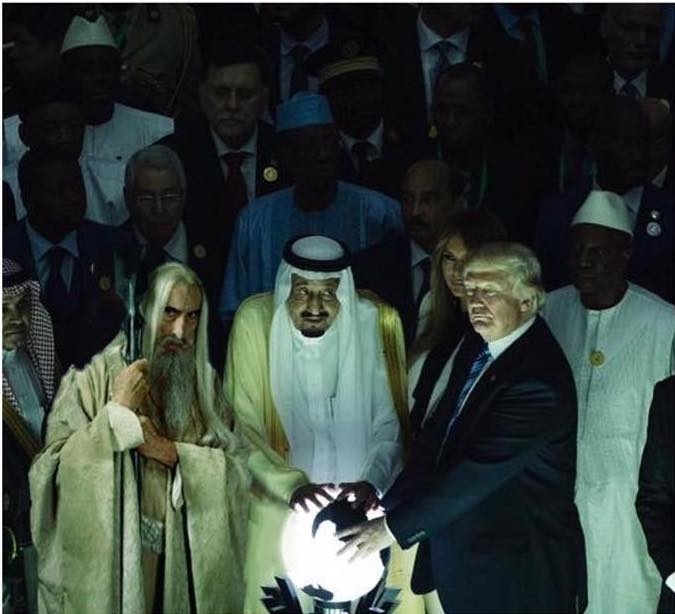 It wouldn't let me upload the one I have where someone replaced the orb with the Eye of Sauron, but here's this one. Yeah but Hitler is already dead, or at least hiding in Argentina or wherever, so this will work in the mean time.